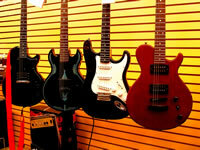 In this section we will try to help you decide which guitar is best for you. We have provided a number of articles on such topics as Buying a guitar, Guitar Practice, Learning the Guitar, String Muting, Playing Harmonics and Guitar Tabs. Some of these articles have been republished with thanks to www.articlerich.com and their writers. The guitar is one of the most popular musical instruments today to bring out soothing music or to perk up one's energy level. Bands and gigs will not be complete without guitars. Guitars are also used as a means to free hidden and unexpressed feelings and emotions or it can as well be a medium to spend time meaningfully together with loved ones and peers. There are various types of guitars that can suit the intended purpose of the user such as the twelve strings guitars, six strings, classical guitars and electric guitars. Twelve strings made up the twelve strings guitar to achieve a rich tone compared with the standard six string guitars. The courses of strings are played together though the sound produced are different from the other. On the bass course are two strings tuned an octave apart and on the treble courses are the other pairs of strings that are tuned together. The third string in the third course can be tuned by using unison strings or the distinct high-pitched octave guitars strings. The style of standard six string guitars can allow the user to have easy contact on the higher frets on the finger board. This type needs an access on the frets to produce the desired sounds and effects. are best played using classical guitars. Electric guitars are made up of different materials and use various components to produce the needed sound. and the construction, the types of strings, quality of components used, length of cables and the overall condition of the environment determine the quality of the sound produced. Electric guitars are used in various forms and styles of music may it be pop, country, rock and roll, jazz or blues. In buying guitars, the user must make sure that the chosen guitar will match his budget, playing style and skills. An electric guitar is easier to play compared with an acoustic guitar. Acoustic guitars can produce audible sounds without using amplifiers. It makes use of either the nylon or wound steel rings. There are also acoustic and electric guitars that can be played with the presence or absence of an amplifier. Package deals are at times offered for beginners which may include a guitar together with other options like a tuner, pics, strap and case. The soundboard of the guitars must be carefully inspected to determine the type of sound produced. Producers of good quality guitars are usually the well-known companies in the industry like Taylor, Gibson, Yamaha, Fender, Ovation, Martin and Ibanez. There are wide selections of style and design to choose from to match the buyer's distinctness and uniqueness. Article written By David Arnold Livingston. "Article Source: http://www.articlerich.com "
David Arnold Livingston is a music lover and enjoys guitars. Visit: ufguitar.com/ for lots of great information about guitars.